It’s been three years since the official release of Windows 10. Over the past three years, Microsoft has managed to fix most of the bugs and known issues that Windows 10 launched with by releasing numerous minor and major updates. Windows 10 operating system brakes less often now. It’s stable, faster, and better than before. That said, once in a while, you might come across an issue. For instance, Windows 10 might fail to recognize a connected printer. To help PC users quickly deal with common issues, Windows 10 ships with several troubleshooters. There are over 15 built-in troubleshooters in Windows 10, and they can help you fix most of the known issues within a few minutes that you otherwise need hours to fix. You can find all the troubleshooters by navigating to Settings app > Update & security > Troubleshoot. Starting with Windows 10 Redstone 5 (version 1809), there is a new option which automatically applies recommended troubleshooting for known issues on your Windows 10 PC. The recommended troubleshooting feature is turned on by default. When it’s turned on, it automatically applies recommended troubleshooting for known problems to help you avoid manually troubleshoot and fix issues. In some cases, this might also help you from encountering common Windows 10 issues on your PC. 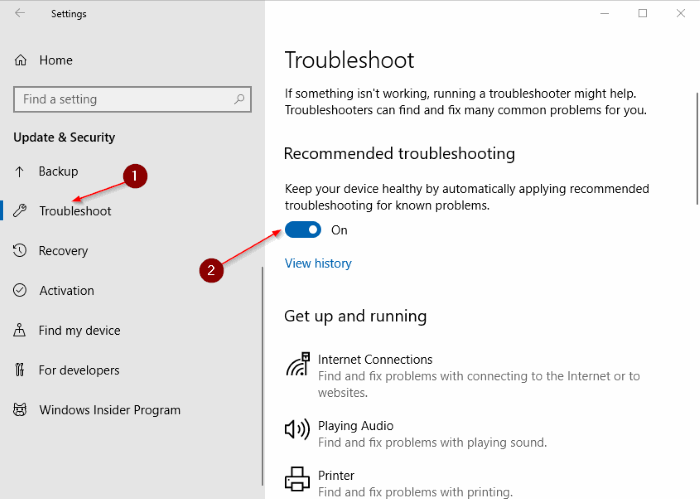 Here is how to turn on or off recommended troubleshooting in Windows 10. NOTE: This feature is present in Windows 10 Redstone 5 (version 1809) and later versions only. Step 1: Open the Settings app and navigate to Update & Security > Troubleshoot. Step 2: In the Recommended troubleshooting section, turn on or off Keep your device healthy by automatically applying recommended troubleshooting for known problems option. As you see in the picture above, you can click the View history link to see if your PC has received any recommended troubleshooting. Our 10 free tools to repair Windows 10 article might also interest you.